ALD Automotive, an international provider of vehicle leasing and fleet management services, has issued its first-ever Positive Impact Bond to drive the low-carbon transition of its fleet. 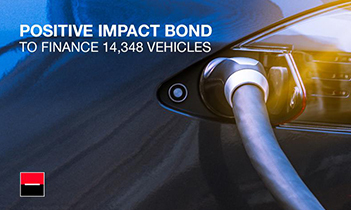 The transaction marks a major milestone for the development and diversification of the green bond market, with ALD Automotive becoming the first company in the automotive sector to obtain the Climate Bond Initiative certification. With the €500 million bond, the subsidiary of Société Générale will finance or refinance a fleet of eligible vehicles across 13 countries in Europe, including electric (EV), hybrid electric (HEV) and plug-in hybrid vehicles (PHEV), with priority being given to those with the greatest net positive contribution. As the green bonds market evolves, investors increasingly expect greater transparency from businesses on the expected environmental impacts of the efforts being financed. To demonstrate the positive impact of its bond, ALD Automotive teamed up with Quantis to develop a robust, metrics-fueled methodology to evaluate the fleet’s environment impacts. Quantis also delivered a tailor-made tool enabling ALD Automotive to assess the environmental performance of its fleet for annual CSR reporting and fine tune its vehicle portfolio to have the greatest positive impact. Based on a life-cycle approach, the methodology’s scope covers the entire vehicle life-cycle, from production to use phase emissions of nitrous oxide (NOx), particulate matter (PM) emissions and greenhouse gases, and end-of-life considerations. Analysis revealed that ALD Automotive’s initial portfolio avoids 17,000 tons of CO2-equivalent and 99,000 kg of NOx emissions on annual basis, compared to a comparable fleet powered by combustion engines. “Responsible investment is a powerful lever to promote the transition to more environmentally sound solutions, provided it is accompanied by solid environmental metrics. Only a life-cycle approach, such as the one developed for ALD Automotive, can capture the potential transfers of impacts (especially those from electricity production) and thus ensure the environmental benefits of the green fleet,” said François Witte, Senior Consultant at Quantis. The Positive Impact Bond Framework was externally reviewed by Vigeo Eiris and is aligned with both the ICMA Green Bond Principles and the Principles for Positive Impact Finance developed by the United Nations Environment Program (UNEP). Contact François Witte to discuss how robust environmental metrics can strengthen your climate finance strategy.